The Nativity Story is a 2006 biblical drama film based on the nativity of Jesus, directed by Catherine Hardwicke and starring Keisha Castle-Hughes and Oscar Isaac. The film was released on December 1, 2006 after it premiered in Vatican City November 27, 2006. The Nativity Story was the first film to hold its world premiere in Vatican City. The film then goes back one year before the massacre, to Jerusalem where Zachariah is a rabbi and making an offering, when he gets told by the Archangel Gabriel that his wife will bear a son by a vision. He states that he is too old, and is told by Gabriel that he will be unable to speak until the boy is born. 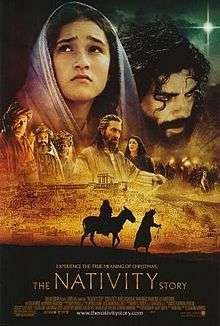 It then goes to the town of Nazareth, where a teenaged girl named Mary (Keisha Castle-Hughes) is farming, and soldiers come to collect taxes, one man, who is unable to pay, has a third of his land seized and his daughter pressed into debt slavery to pay his debt. Mary is then, betrothed to marry Joseph of Judaea (Oscar Isaac), is visited by the Angel Gabriel and told that she will become pregnant with God's son, whom she is to name "Jesus". He then tells that her God has blessed her cousin Elizabeth (Shohreh Aghdashloo) with a child despite her old age. Mary asks her parents and Joseph could she visit with Elizabeth before the harvest, where she witnesses the birth of John the Baptist to Elizabeth and her husband the priest Zachariah (Stanley Townsend), who regains his speech after he refused to believe the Angel Gabriel's news that he would have a son. Mary returns from the visit pregnant, to the shock of Joseph and her parents, who fear that Joseph will accuse her of fornication, a sin punishable with death by stoning according to the Mosaic Law. At first Joseph does not believe Mary's explanation that she was visited by the angel Gabriel, but decides not to accuse her. Although he is still shocked and angry, Joseph is later visited in a dream by the Angel Gabriel, who tells him of God's plan for Mary's son. Joseph then believes Mary, and is ashamed for his earlier doubts. Meanwhile, Caesar Augustus, the Roman emperor, has demanded that every man and his family across the Roman Empire must return to his place of birth for the census. As a direct descendant of King David, Joseph is forced to travel 110 kilometers (68 mi) across Palestine's rocky terrain from Nazareth to Bethlehem, the place of his birth. With Mary on a donkey laden with supplies, the couple took nearly four weeks to reach Bethlehem. Upon arriving in town, Mary goes into labour, and Joseph frantically seeks a place for her to deliver. There is, however, no room in any inn or home partly because of the census, but at the last minute an innkeeper offers his stable for shelter. Meanwhile, three Magi named Gaspar, Melchior and Balthasar, travel towards Judaea after having previously discovered that three planets will align to form a great star. This Star of Bethlehem appears before the Magi, after a visit by the Angel Gabriel. The Magi visit King Herod the Great and reveal to him that the Messiah is still a child and he will be a Messiah 'for the lowest of men to the highest of kings'. Shocked by this, Herod asks that they visit the newborn Messiah and report the child's location back to him, under the pretence that he, too, would like to worship him (what the Magi did not know was that Herod wanted to kill the baby for fear of a new king taking his throne). Later, the Magi arrive at the stable in which Mary is giving birth to Jesus, and they present the Infant with gifts of gold, frankincense, and myrrh. After having been warned by the Angel in a dream, the Magi avoid Herod, but return to their home via a different route. King Herod realises that the Magi have tricked him, and carries out his plan of killing every boy in Bethlehem under the age of two. Joseph is warned in a dream of the danger and flees to Egypt with Mary and Jesus until Herod the Great dies and his two remaining sons (Herod was so paranoid that he killed his own wives, sons, and daughters) named Archelaus and Antipas take over his kingdom and Rome divides the kingdom- Archelaus gets the kingdom of Jerusalem, Bethlahem and Antipas gets the kingdom of Nazareth, Gailee. At the end of the movie, Joseph, Mary, and Jesus return; but do not go to Bethlehem for fear of Herod's oldest son and instead go to Nazareth. Filming began on May 1, 2006, in Matera, Italy, and Ouarzazate, Morocco. Other scenes were shot in Craco, a ghost town in the Italian region of Basilicata, and Cinecittà, Rome. The Nativity Story opened to a modest first weekend at the domestic box office by grossing $7.8 million, with a 39% increase over the extended Christmas weekend. After its initial run, the film closed out with about $37.6 million in domestic gross and $8.8 million in foreign gross, resulting in a worldwide total of almost $46.4 million on a reported $35 million budget. The movie received mixed reviews. Review aggregator Rotten Tomatoes reports that 38% of 128 film critics have given the film a positive review, with a rating average of 5.3 out of 10. Metacritic, which assigns a weighted average score out of 100 to reviews from mainstream critics, gives the film a score of 52 based on 28 reviews. A. O. Scott of The New York Times gave the film a positive review saying, "At its best, The Nativity Story shares with Hail Mary an interest in finding a kernel of realism in the old story of a pregnant teenager in hard times. Buried in the pageantry, in other words, is an interesting movie." Ann Hornaday of The Washington Post concluded a positive review of the film stating, "The most intriguing thing about The Nativity Story transpires during the couple's extraordinary personal journey, advancing a radical idea in an otherwise long slog of a cinematic Sunday school lesson: that Jesus became who He was not only because He was the son of God, but because He was the son of a good man." Conversely, many critics felt that the film did not take the story to new cinematic heights. Owen Gleiberman of Entertainment Weekly noted, "The Nativity Story is a film of tame picture-book sincerity, but that's not the same thing as devotion. The movie is too tepid to feel, or see, the light." Kenneth Turan of the Los Angeles Times said, "This is not a chance to 'experience the most timeless of stories as you've never seen it before' but just the opposite: an opportunity, for those who want it, to encounter this story exactly the way it's almost always been told." Keisha Castle-Hughes became pregnant during filming and received a lot of media attention. Mychael Danna's score of the film was released as an album on December 5, 2006. The album was nominated for a Dove Award for Instrumental Album of the Year at the 39th GMA Dove Awards. An album of songs inspired by the film was also released under the title The Nativity Story: Sacred Songs. It featured music by artists like Point of Grace, Amy Grant, Jaci Velasquez, and others. ↑ Kiefer, Peter (November 27, 2006). "Vatican Plays Host for 'Nativity Story' Premiere". The New York Times Company. Archived from the original on June 22, 2014. Retrieved June 22, 2014. ↑ "Nativity (2006) Filming Locations". IMDB. Retrieved 2 December 2013. ↑ "Weekend Box Office Results for December 1-3, 2006". IMDB. Box Office Mojo. Retrieved 14 December 2012. ↑ "The Nativity Story (2006) – Weekend Box Office Results". IMDB. Box Office Mojo. Retrieved 14 December 2012. ↑ "The Nativity Story (2006)". IMDB. Box Office Mojo. Retrieved 14 December 2012. ↑ "The Nativity Story – Rotten Tomatoes". Flixster. Rotten Tomatoes. Retrieved 14 December 2012. ↑ "The Nativity Story". CBS Interactive. Metacritic. Retrieved 14 December 2012. ↑ Scott, A. O. (1 December 2006). "The Virgin Mary as a Teenager With Worries". The New York Times. Retrieved 14 December 2012. ↑ Hornaday, Ann (1 December 2006). "Chapter and Verse". The Washington Post. Retrieved 14 December 2012. ↑ Gleiberman, Owen (29 November 2006). "The Nativity Story (2006)". Entertainment Weekly. Retrieved 14 December 2012. ↑ Turan, Kenneth (1 December 2012). "'The Nativity Story': A "Story" told with too much naiveté". Los Angeles Times. Retrieved 14 December 2012. ↑ "Introducing Felicity-Amore Hull — Keisha speaks about her labor, delivery, and new little girl". People. 8 June 2007. Retrieved 14 December 2012. ↑ "Soundtrack - The Nativity Story: Sacred Songs - Amazon.com Music".